After the success of Transform 2011 Conference: What’s Next in Marketing, Media & Advertising?, Event Architects (Pvt.) 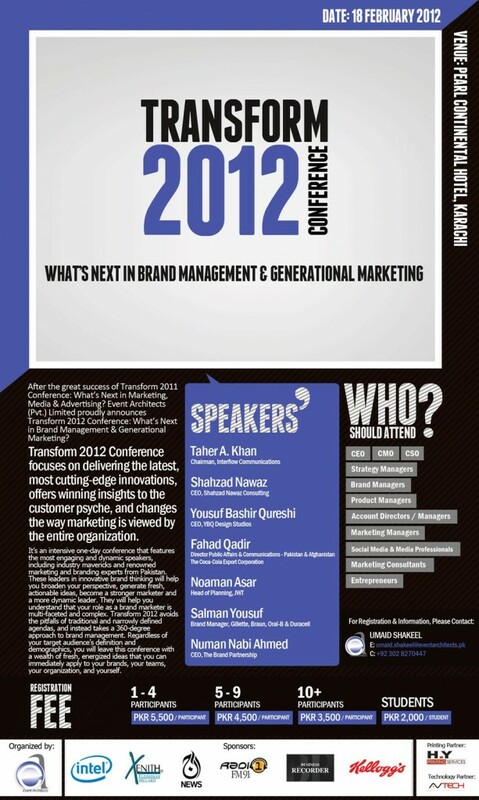 Limited is organzing Transform 2012 Conference: What’s Next in Brand Management & Generational Marketing? Transform 2012 Conference focuses on delivering the latest cutting-edge innovations, offer winning insights to the customer psyche, and change the way marketing is looked at by the entire organization. Participants will learn from senior marketing and branding executives how to build and leverage brand value, improve brand relationships, manage corporate brands, build their brand with employee involvement and the method of marketing to a specific age group.